I’ve actually been following the site since it’s inception in October of last year. I must say, it’s going to be a bit difficult for me to come up with criticism because I enjoy the site thoroughly. I really feel the site fills a need and that fact alone puts Kyle in a great position to succeed (unlike his beloved Cubs 😉 ). As you might expect, the site covers everything involved in using WordPress. Kyle covers as many themes, plugins, and naturally hacks as he can get his hands on. For example, one of his most recent posts was an in depth discussion about the future of premium wordpress themes (a subject I’m more than a little interested in). Another one of my favorite posts gives a long list of what Kyle considers to be the best plugins for all sorts of categories. I get questions about this all the time and I’ve got to say, I might just start pointing people to this post. If you’re looking at using or purchasing any themes, either free or premium, I’d suggest checking out Kyle’s review before you do. As I said, it was difficult to come up with critiques but I did find a few. First and foremost, I’d really like to see the categories as a drop down item in the main navigation at the top of the site. With the block of 125×125 ads, and popular posts, etc, you have to scroll almost half way down the page before you can find the category list. The other significant change I’d like to see is a splash of color on the site. I love the blue in the logo in the header, but I wish there were a bit more throughout the rest of the site. When you get down towards the middle of the page or the comment section, the different shades of gray can get a bit depressing. Overall though, I really can’t say enough good about HackWordPress.com. Kyle’s got another great site on his hands (he also writes for slickmania.com and slickdomains,com) and I’m certain it will be successful for a long time. If you haven’t yet, you should absolutely subscribe to his feed. 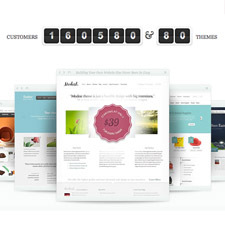 Elegant Themes Has Over 160,000 Customers! Time To Join. Looks like a pretty well done informational site. I bookmarked it for further reading later, as I’m always looking for ways to improve my wordpress install. Thanks for the review, not something I would have searched for or found on my own. Thanks for the review (and congrats on working on a way to diss my Cubs in the process!). Glad to see you’ve been enjoying the site. Because it gets the most traffic, I also put the most work into it, and I really enjoy writing about WordPress. Hopefully that passion translates into the writing. As for your two suggestions, I think they are great ones. Funny thing is I have a redesign about half completed that I hope to have up this weekend, along with Hack WordPress forums. It will stay true to the current design, but allow me more control over how I want to display things on the site. It does include a drop-down category menu at the top and I’ve been trying to integrate more blue into the site (something others have suggested as well). It probably won’t be a ton of blue, but much more than there is now. The only thing I would add is that it was established as a multi-author blog in the hopes that people could then get a variety of hacks, takes, and opinions on WordPress, rather than just get one persons views. You’ll see some other authors drop a post up every now and then to keep things fresh. Anyway, thanks again for the great review! wow thanks for passing that site along. There goes my weekend! WordPress is the most popular blog script and there is a huge market for anything to do with WordPress. I like everything that HackWordpress.com has to offer so far that I can see. Very useful site that I’ll frequent very often. Thanks! The only thing I would add is that it was established as a multi-author blog in the hopes that people could then get a variety of hacks, takes, and opinions on WordPress, rather than just get one persons views.